Computers and their end product devised for Saturn V-automatic checkout of flight hardware-were much in evidence at the Kennedy Space Center. This view of the control center, with row on row of computer consoles, is only one portion of the system. High reliability is needed; vehicle is expensive and is man-rated. Truly integrated designs of stages and support equipment would reduce the number of operational problems. Human errors and human slowness must be improved upon. An engineering approach is feasible throughout design, production and test, military restraints being absent. The time scheduled for checkout must be used more effectively than on previous programs. The volume of technical data to be measured and handled is extremely large; each flight stage alone has hundreds of measuring devices aboard (perhaps as high as 1000). All data must be transmitted long distances on a limited number of channels. Launch pads are far from control consoles. Stage checkout must meet launch needs. Test and launch data must be retrieved, stored, and made available to many organizations. Automation increases the powers of human operators to deal with complex situations and frees them for decision-making. In the pre-Saturn days of rocket and missile operations, many checkout procedures were performed manually and worked well with complex vehicles like the Thor-Delta. Douglas engineers used manual checkout techniques for the earliest S-IV stages; pre-checkout, acceptance firing, and post-checkout required a total of 1200 hours per stage. Veteran "switch flippers," who for so long scanned gauges and dials, flipping the right switch in a critical situation, had been vital links in the overall loop. They were now replaced by ranks of gray-enameled computers. For checkout procedures on the Saturn V third stage, the S-IVB, fully automaticd techniques replaced the manual checkout for the first time. Although the magnitude of testing rose by 40 percent per stage, the new automaticd systems reduced the checkout time to about 500 hours total. H. E. Bauer clearly remembered the occasion when men and the new machines first confronted each other. "One seasoned switch flipper came into the blockhouse after the equipment was installed; he watched the blinking lights, the scanners, the recorders- everything was working automatically, heaving out wide and endless runs of data printouts...." The man balefully surveyed the mechanically throbbing interloper and growled. "It's the Gray Puke!" It was not an isolated reaction. As Bauer recalls, the ghastly name stuck and became part of the permanent lexicon associated with the S-IVB stage. With computer data accumulated for each stage and subsystem, the collected information was not only utilized for vehicle checkout at the Cape, but also for the launch and for guidance and control during the mission. After years of research and development on the individual stages, involving thousands of workers and millions of man-hours, most of the responsibility for the six-hour flight of a Saturn V devolved on a piece of equipment known as the instrument unit-the "IU." A thin, circular structure, only 1 meter high and 7.6 meters in diameter, the IU was sandwiched between the S-IVB stage and the command and service modules. Packed inside were the computers, gyroscopes, and assorted "black boxes" necessary to keep the launch vehicle properly functioning and on its course. Historically, the problems of traveling successfully from point A to point B on the Earth's surface depended on some form of visual references, such as tall trees, mountains, or some other easily sighted  landmark. Longer journeys overland, where familiar landmarks were unavailable, and extensive sea voyages, out of sight of any landmarks at all, came to rely on guidance instruments such as compasses and the astrolabe. Rocket vehicles, on the other hand, with their extremely high speeds, altitudes, and long-range capabilities, came to depend on advanced guidance systems coupled with control systems that were essentially automatic. The guidance and control techniques applied in the Saturn program involved many problems. Successful solutions were reached partly through new research and development and partly through the use of proven techniques and hardware adapted from existing systems. The Saturn digital computer and the data adapter stand out as new developments. 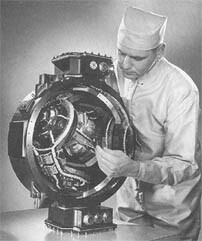 The inertial platform, on the other hand, was a result of concepts and hardware worked out in the late 1930s and early 1940s in Germany. The ST-8O of the Redstone evolved into Jupiter's ST-90 (1957); both were turned over to the Ford Instrument Company for manufacture. When the Saturn I began to evolve, the Army Ballistic Missile Agency (ABMA) guidelines called for the use of proven and available hardware wherever possible. For example, the early Saturns incorporated the ST-90 stabilized platform with an IBM computer, the ASC-15 model, adapted from the equipment used on the uprated Titan II.20 At a later date, as other vehicle test milestones were passed, a different guidance and control unit was proposed. This new unit, the ST-124, was an improved inertial guidance platform intended for the Saturn V's complex and long-term orbital mission. The ST-124 inertial guidance platform is given a technical check (left); above is a schematic of its systems. ....accumulated from the V-2, the Redstone, and subsequent vehicles developed by the von Braun team. Beginning in 1958, work on the IU was concurrent with the Saturn I. On 15 June 1961, the mockup of the IU was completed at Huntsville and scheduled to fly in the Block II series of the Saturn launch vehicles.21 For the Block I vehicles with dummy upper stages, guidance and control equipment was packaged in canisters located at various points in the adapter area atop the S-I first stage of the Saturn I. This equipment included telemetry, tracking, and other components, such as the ST-90 guidance platform and a guidance signal processor. Plans called for an additional canister to carry the ST-124 platform as a "passenger," thus beginning its sequential tests and qualification as the active guidance component for later Saturn I, Saturn IB, and Saturn V flights. The instrument unit used in Saturn IB and Saturn V is shown in component detail in the drawing at left; below [middle], left, in IBM's Huntsville facility, lUs are joined together and instrumented. Two of the key components in the IU are the launch vehicle digital computer (below [middle], right) and the launch vehicle data adapter (bottom, left). At bottom right, this completed IU is undergoing rigorous checkout and test before shipment to KSC. Both IBM and MSFC engineers are monitoring the checkout. The ground rules for the design, research, and development of the IU came out of MSFC, and these concepts carried over into the production models delivered by IBM. With cost constraints and tight schedules limiting the number of test flights, the number of measurements for each flight was expected to be quite high and to vary considerably from one flight to another. For this reason, flexibility for the instrument unit had a high priority and designers emphasized a modular approach as means to provide both flexibility and ease of servicing. Another strongly emphasized feature was reliability; a key factor, particularly because the Saturn program was geared to manned launches. In addition, liability was enforced by the high cost of each vehicle and limited test flights, which naturally produces a reluctance to fly exotic, untried, hardware. As James T. Powell, of Marshall's Astrionics Laboratory stressed, "We simply cannot afford the time or money to launch additional vehicles to obtain data lost by instrumentation equipment failures. This has led to a rather conservative approach to system design." Some innovations, such as new modulation techniques or micro-miniaturization, might turn out to be "equivalent in importance to the invention of the wheel," Powell remarked, but would not be used in the Saturn program until they had undeniably demonstrated their operational reliability.26 Nevertheless, the scope of the missions for Saturn V required additional changes and improvements. These alterations were introduced and checked out during the Saturn IB series, which not only carried the same basic instrument unit as the Saturn V but also involved manned launches and carried the similar S-IVB upper stage. 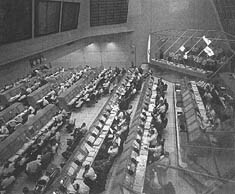 Categorized as the "brain" and "nerve center" by the MSFC Astrionics Laboratory, the IU, with its modular construction, facilitated the changing of components and computer programs, without major modifications, for different missions. The basic functions of the IU included guidance and control during all phases of flight; command and sequence of vehicle functions, including engine cutoff and separation of the stages; insertion into orbit; and relay of data on vehicle position, vehicle functions, and other information to ground stations. In the case of the Saturn V, the IU also functioned in (1) the transfer of the S-IVB, the IU, and the command and service modules into the lunar transfer trajectory; (2) the stabilization during transposition and docking; and (3) the  maneuvers to clear the S-IVB and IU from the flight path of the CSM on its route to the moon.27 The IU itself was viewed as five major systems: structural, guidance and control, electrical, instrumentation, and environmental control. The duplex memory system incorporated two separate sets of memory systems that operated in harmony during critical phases of the mission. This not only reduced the chances of system failure but operated so that one memory system could correct the other if intermittent failure should occur. The system consisted of six modules operating as pairs of duplex memories, each with 4096 computer words of 28 bits and designed to accept two additional modules for special mission requirements. The unit logic devices featured microminiature circuitry, resulting in a smaller, lighter system, having seven times more components than earlier computers while operating at three times the speed. Typically, each unit logic device was produced as a "wafer," 7.6 millimeters square and 0.71 millimeters thick. A total of 8918 such wafers were mounted on dozens of "pages," about 7.6 centimeters square, in the computer. The unusually light weight of the computer was achieved by the use of a magnesium-lithium alloy chassis, the first application of this alloy in structural fabrication for an electronics application. Weight being extremely costly in the upper stages of a booster, MSFC used the magnesium-lithium alloy construction, along with an integral cooling system, to save 29 kilograms. In selecting a suitable material, designers turned down the  even lighter beryllium because of toxicity and technical difficulties in machining and boring. Magnesium-lithium was still quite light (25 percent less than conventional magnesium and 50 percent less than aluminum) and possessed a very high weight-to-strength ratio, good thermal qualities for operation in space, and minimal transfer of mechanical vibration. The power to run this complex electronic equipment emanated from four 28-volt DC batteries, which consisted of special distributors and regulators for both low-voltage components and higher currents for the ST-124 inertial platform. The electrical system also included the emergency detection network to analyze vehicle malfunctions. Depending  on the seriousness of the problem, the emergency detection network either responded with an automatic abort sequence or gave the astronaut crew and NASA flight controllers time to assess the situation. 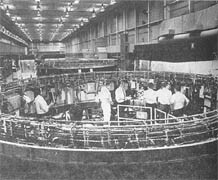 Despite the great emphasis on clean room facilities and spotless surroundings, IBM on one occasion finished production of an IU on the deck of a barge while floating down the Tennessee and Mississippi rivers. During 1965, work on the IU fell behind as a result of changes in instrumentation. The schedule for "stacking" the first Saturn IB (AS-201) for launch early in 1966 was apparently going to slip badly unless work on the IU could be accelerated. Marshall executives pressured their own IU project managers by demanding to know what they were going to do to make the launch date. Luther Powell and Sidney Sweat, from the IU project office at MSFC, brainstormed the situation and proposed a way to make up time. At that point, there was no aircraft large enough to deliver the IU by air. Instead, the IU was scheduled to be carried to the Cape via a barge down the Tennessee and Mississippi rivers, one of the most time-consuming elements in the IU delivery schedule. Powell and Sweat proposed finishing the IU while enroute aboard the barge and submitted their idea to their IBM counterparts, who agreed with the unlikely proposal. Because the enclosed barge was equipped with internal environmental controls anyhow, it was no great problem to set up a workable clean-room atmosphere by rigging a series of heavy plastic shrouds for additional environmental control inside the barge canopy. Marshall and IBM specialists agreed on specific jobs to be done on the barge so that no critical areas or hardware would be subject to environmental degradation during the trip. With detailed work schedules set up, arrangements were made for delivery of key parts and supplies at designated ports along the river. In case of unanticipated  needs, constant radio contact with MSFC permitted instantaneous dispatch of a light plane with emergency deliveries to any nearby airport; there, a government truck could pick them up and deliver them. Development of checkout systems and the instrument unit reflected the same patterns as stage development. Despite attempts to rely on existing systems and equipment, the size and sophistication of the Saturn program required new development. New computer languages such as ATOLL were introduced to solve problems arising from the peculiarities of design, test, and several different contractors, each of whom had been using different computer languages. Automation of checkout and of static-firing tests of Saturn stages was a notable accomplishment, even if, some test engineers were reluctant to surrender control to new, electronic masters. The instrument unit, using many theories and design features that originated in the wartime V-2 program in Germany, is an interesting example of technology transfer. Of course, the Saturn program itself generated several advanced ideas. The need to reduce weight stimulated new research into the use of beryllium and lithium-magnesium alloys; reliability and operational requirements stimulated new research in microminiature circuitry such as the triple modular redundancy. Obviously, each contractor had a responsibility for managing its own respective engine, stage, or instrument unit. Overall management and coordination of these various elements was NASA's responsibility, a job carried out by the Marshall Space Flight Center, which also supervised the delivery of the Saturn's various parts to test sites and to Cape Kennedy for launch.